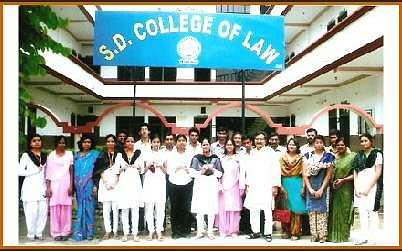 SD College of Law is a pioneer institute for carving better lawyers to uphold and preserve the Indian Judiciary System. The aim of this institute is to help the students evolve into better and legally healthy human beings with the help of a smart and challenging Degree. The College claims to deliver good results and be a play a part in crafting great lawyers that will uphold the law and act as their keepers. The way to achieve its goals is by working towards mixing modern ideas and traditional values, to get a unique blend of both, which can guide the students well. Facilities provided are enough of help a student become a good protector of law. Guest lectures by advocates and judges along with various other activities entice students to be a part of a very dynamic campus. SDCL provides an Integrated B.A. LLB or 5 years making the students ready to face the emerging challenges of modern law firms. The personality development program is noteworthy as it aims to pull out the hidden qualities in an individual’s character. Tournaments and sports meets are frequent. 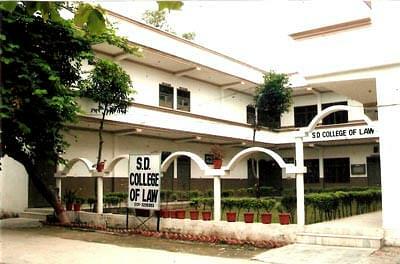 Why Join SD College of Law, Muzaffarnagar, Uttar Pradesh? Faculty: The teachers are the kind who love to help the students. They are more like collaborators who help the students learn the nuances of the subjects. Tests are regular, and discipline needs to be maintained at all times. Campus: The campus is beautiful with all world class facilities within the boundaries. The ambiance is conducive to education. It's outside the proper city thus provides a nurturing environment. One degree only: The Institute has 160 seats dedicated to only one degree and concentrates on that.